A lawyer on Wednesday got his head tonsured as a mark of protest over delay in establishment of a permanent bench of Orissa High Court here. 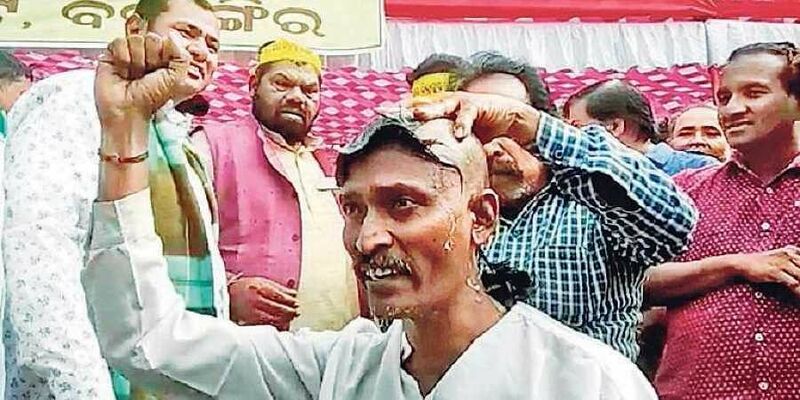 BALANGIR: A lawyer on Wednesday got his head tonsured as a mark of protest over delay in establishment of a permanent bench of Orissa High Court here.Pressing for their demand, lawyers staged a demonstration in the town on Wednesday. During the protest, lawyer Madan Seth got his head tonsured in public alleging that the State Government has remained indifferent to their genuine demand. Several outfits, including Karan Samaj, also joined the protest. Members of the organisations took out a massive rally in the town and joined the demonstration in front of the Collectorate here. Bikram Bohidar of Karan Samaj expressed his organistation’s support to Balangir Lawyers’ Association over their demands. Since December 3, the association has been observing a week-long closure of all major Government offices, including the Collectorate, tehsil office and the courts in the district. The Joint Action Committee and the lawyers on Tuesday had staged a demonstration outside the Collectorate and the civil courts and ensured closure of the collectorate and tehsil office. On Wednesday, the protesters had obstructed Collector Arindam Dakua from entering his office.